At a recent training for the Austin Independent School District (ISD) in Texas, the staff at EcoRise Youth Innovations posed a challenge to the over 200 K–12 teachers present: how might we increase the amount of school waste diverted from landfills? Using an activity from the Design Studio curriculum, teachers “walked in the shoes” of school custodians and other stakeholders to understand their roles in addressing this challenge. That same day, the district’s sustainability manager trained Austin ISD custodians on best practices for composting on school campuses. 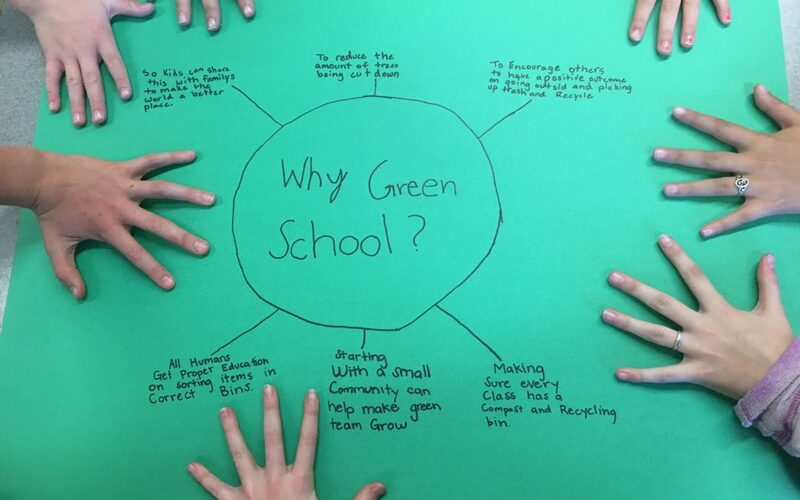 What’s unique about EcoRise’s approach to sustainability education? Abby Randall (AR), Program Manager: Education is very testing-focused these days, and science curriculum is often prescribed down to the minute. In a high-stakes testing environment, teachers have to focus on rote memorization and test-taking skills which is a very teacher- or admin- or school board-driven approach. What we offer that’s unique is student innovation. The most effective projects we see have students at the helm, guiding the process. Teachers and administrators must relinquish control, which can feel scary, but it allows students to wrestle with authentic problems in real-time. We are empowering teachers to apply the principles of design thinking to encourage innovation and creativity in their classrooms, while at the same time using the principles of design to ensure a user-friendly experience for our teachers. I think the design process is relevant to any career. That’s what I love about our Design Studio curriculum. Teachers can come to our training and walk away with twenty activities in their back pocket that they can incorporate into any classroom project or unit. Christina Mirando (CM), Chief Designer: From a design perspective, [we ask], what are the needs of the people we’re serving? It’s identifying the root cause, problem, or challenge that creates a more informed and intentional product in the end, and for EcoRise, it’s having our students be informed by the design process—by data, stakeholders, empathy—to create a richer learning experience. It’s all about teaching the process, not being solely focused on the output. By overlapping design and education, what does EcoRise hope to instill in teachers and students? AR: Agency. We want both teachers and students to identify a challenge and know that they can tackle it, have some sort of measurable impact, and not just be helpless bystanders. Ideally, EcoRise experiences will empower students to seek out a career path where they can continue to have a positive impact on the world around them. And I think for teachers, the most powerful piece is being able to inspire in their students a curiosity about the world around them, which is so inherent in science. CM: Curiosity. The more you look around, pay attention, and observe the usability or functionality of beauty, the more you’re assessing and observing the decisions people made. That sense of curiosity can ultimately create a more compassionate understanding of why people made those decisions, which is an empathetic trait as well. Who or what are your personal influencers in effective design or sustainability education? CM: I was very inspired by 1910 surrealist movements. It was all about collaboration and abstract expression. Presently I love the more technical designers like Paul Rand and James Turrell, using minimal designs and light to create really beautiful forms. And personally, I grew up with Tibetan Buddhism. It’s like a blend of fine arts and minimalism and also intentionality and mindfulness. AR: Anything relating to sustainability is tangible – it’s easy to engage students in exploring the water that they drink, the air that they breathe, the energy that powers their cell phones. I taught for about six years, five of them in Austin, and did some work in Boston Public Schools around food pathways and sustainable agriculture with third graders. I have taught almost every science course from 6th through 12th grade, and I had the great privilege to use EcoRise resources to empower my middle school students to take action. Alice Waters, Michael Pollan, Richard Louv, and Wendell Berry are just a few of the activists and thought-leaders who have influenced the way that I view sustainability and education. The importance of connecting students to nature, and encouraging them to think critically about the resources that they consume, cannot be understated. EcoRise will be presenting at the Green Schools Conference and Expo in Atlanta this March. What else can we expect from EcoRise in the coming year? AR: Students can apply for our micro-grants any time from when school starts to the first week of April. We offer a video submission option now as a creative outlet for students to demonstrate their design process and the direct impact that their projects will have. Our [upcoming] LEED Prep curriculum will be offered through construction and architecture elective courses…the curriculum introduces students to the U.S. Green Building Council’s LEED rating system, provides hands-on learning experiences to enhance classroom instruction, and prepares students for the LEED-GA certification exam. CM: The LEED Prep [curriculum] is all about how to design buildings that are regenerative, all while considering the lens of the stakeholder. And “design” is used so broadly. It has a business implication, it has a human-centered implication, a visual implication, architecture. LEED Prep is a great blend of these practices, which are so relevant today.